January 25, 2018 Chingyiam Panjapiyakul, M.D. Pitulak Aswakul, M.D. 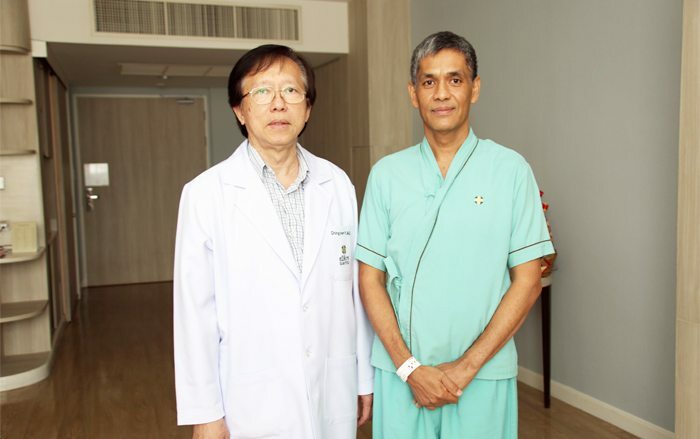 Myanmar expat seeks Minimally Invasive Surgery to remove tumors. Albert talks about how his search for a doctor who could remove his esophageal cancer with minimally invasive surgery brought him to Samitivej. I had an upper endoscopy and also a colonoscopy in 2015. In August that same year, I had a choking problem, especially when I was having breakfast. I eat bread, and I’m a fast eater. Then if I had some concentrated fruit juices, I couldn’t swallow and I had to throw up because I couldn’t breathe. It happened to me once in early September, and after that it happened now and then, once a month or twice a month. There were times again when I had to drink water to swallow it down, and there were times that I had to throw up. On the 8th of February, 2016, I was driving and I took a multivitamin pill, which is quite a big one, and I started to choke. Drinking water didn’t help. I couldn’t throw it up because it was hard so it got stuck in my esophagus. I went to the hospital to have a checkup and then, in the afternoon, they did the endoscopy, and they found something that they suspected was not normal, an ulcer. So they sent for a biopsy and the result came back. It was suspected esophageal cancer. The lesion was quite deep. So they did a second biopsy, but the pathologist could not be sure whether it was really 100% high-grade dysplasia or low-grade dysplasia. It was in a gray area. The GI Doctor wanted to send me to the surgeon for an operation for third stage esophageal cancer. But the GI Doctor wanted to make sure what stage cancer it was, so he sent me to another GI Doctor first to do the EUS, an endoscopy with ultrasound, to make sure how deep the lesion was, into which layer. After about 10 days, I get my EUS results and the GI Doctor informed me that it’s not first-stage cancer yet, but it might be early-stage cancer so we have to monitor it. So he monitored it for a few months, about I think 4 or 5 months, and it was in the middle of June that he found out about a method that can be used to remove the ulcer by using endoscopic submucosal dissection. They call it ESD. Japanese doctors are quite good at this method so the GI doctor took me to Japan to have the procedure. But the Japanese doctor couldn’t perform the surgery because of some complications. I have peptic strictures so he couldn’t remove the ulcer. However, they also confirmed that there were cancer cells already, so I came back to Thailand and the GI doctor advised that I have the ulcer surgically removed. I planned to have it removed but I found out that other hospitals can do only open surgery, which is quite painful and also involves a long time for recovery. They didn’t tell me this in detail but I researched it and I found out. So I started searching for a surgeon who can perform this operation with the MIS technique, minimally invasive surgery. It took me a few months, and I was on a vegetarian diet to lose weight at that time. Then I came here in the middle of February because I wanted to find out how the hospital could do this MIS or not. When I came here, I met Doctor Pitulak and she said I have to have the ulcer surgically removed. She referred me to Doctor Chingyiam and so I went to see him. He said it can be done. He has performed several open cut surgeries for esophageal cancer, but not with the laparoscopic procedure. We scheduled the operation on the 6th of March and the operation went very well. Today it’s the 17th and I’m just discharging from the hospital, so I’m very pleased with the results and all the services provided here. The operation was actually very successful, I think. It’s painful, but I recovered quite fast. I’m surprised that after just 2 or 3 days I was walking and then I start eating. And all is well with the section of the stomach and the esophagus. I don’t feel any pain inside actually. Inside, it’s quite good and I can eat well. I have no pain or choking or vomiting after the surgery, so I think it’s very good. I would say I’ve had very good results. Well, I would tell everyone to be careful and study more about cancer because I had never hear about esophageal cancer in my life before. I had heard about cancer of the brain, stomach, colon, pancreas, and many other types, but I had never heard about esophageal cancer. I ignored it because it was not painful. You don’t feel anything. Sometimes yes, you may have heartburn like reflux, but it’s like normal and you can eat well for a few years and you didn’t know that you have cancer inside you. So I would advise everyone to study which other cancers we have to be careful of, and I think everyone should get a check-up regularly. Ask for advice from the professionals rather than from friends. Go to a reputable hospital, get advice from a medical professional, and have regular check-ups. I would tell you that both of them were very good. Dr. Pitulak is a very passionate person. She cares for the patients and she explains, takes her time explaining the details, how things are, how things are done, and she spent a lot of time with me. No matter how busy she was, she visited me. She works from 6:30 in the morning, but she would always come and visit me every evening at least. She would come at 8 o’clock in the evening, even before she has had her dinner. She will come and sit down and spend time with me and really, she’s a very loving and caring person. She does her work not as a job. She does it because she enjoys taking care of people. And Dr. Chingyiam is also a very knowledgeable person. His experiences are remarkable. He knows many things, and then he also cares for the patients, really wholeheartedly. He told me that the surgery was going to take 6 to 8 hours. I found out afterwards that it was actually 10 hours, but he gave all his time, 10 hours, staying with me and fixing me, making sure that I was 100%, and that I would recover. He removed all the cancer so I am very confident that it will never come back to me again because of him. I told him to cut out all the bad guys, so already I’m fine now. For both of the doctors, they don’t have time for themselves. They spend a lot of time with us to make sure of our well-being. That’s my experience with them.